This quilt is 60” x 60”. 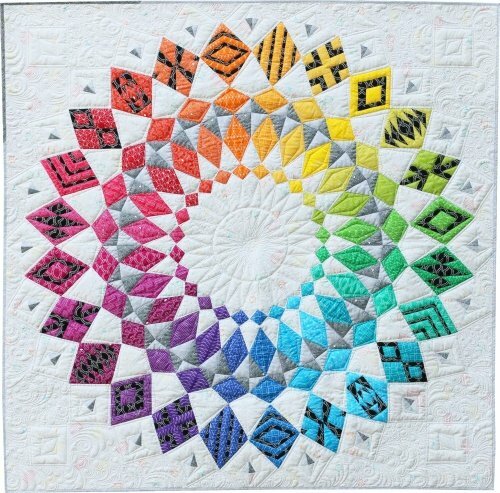 Cadence Court is the newest block of the month design from Sassafras Lane Designs. Created with foundation fabrics in mind, this BOM features 30 fabrics. You will make two wedges a month and the complete setting the last month. There is a $ 5.00 (non-refundable) registration fee. The total cost after that is $ 192.00. You have the option of breaking this up into 12 monthly payments of $ 16 + tax. There are also shipping charges of $ 4.95 per month. If you would like to participate and pay monthly, please call (269) 383-1790 and we will set you up on a monthly payment/shipment schedule.